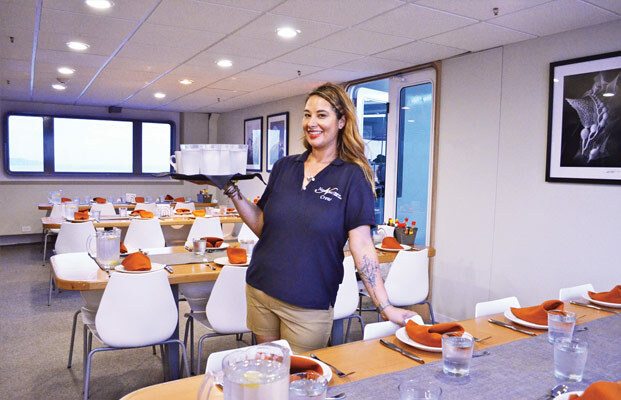 The Best Crew : Nautilus Belle Amie – Luxurious Liveaboard Dive with Giant Mantas at Socorro or Cage diving with Great White Sharks of Guadalupe Island. 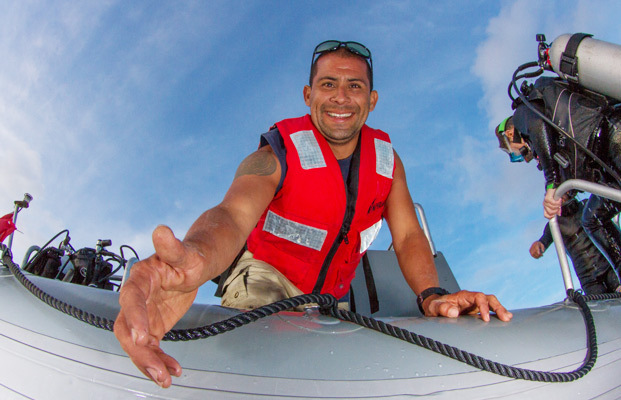 "Our ships are crewed by a wonderful and extremely hard working team of men and women from around the world who love the ocean just as much as you do. The cornerstones of our business have always been; safety, excellence in diving and guest experience, and a great crew that are happy and fulfilled in their jobs. It's easy to say this but much harder to sustain in 24/7 Mexico operations year-in and year-out. I am very proud of our staff and crew and remain constantly impressed by everyone's dedication and how hard everyone works to maintain to look after our guests and maintain the highest possible standards.  Please come onboard and get to know us and see the Nautilus difference for yourself!" 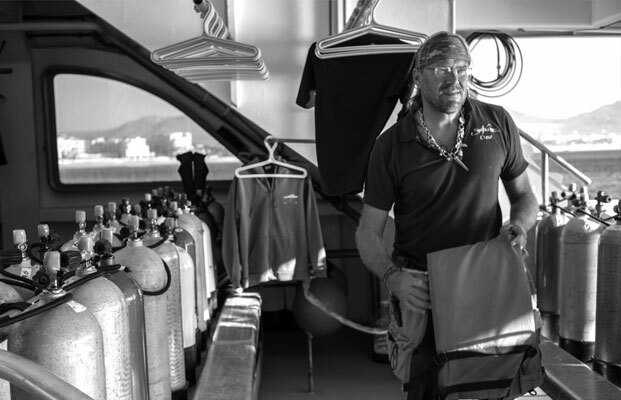 Divemaster Sten "Vikingo" prepping the dive deck. 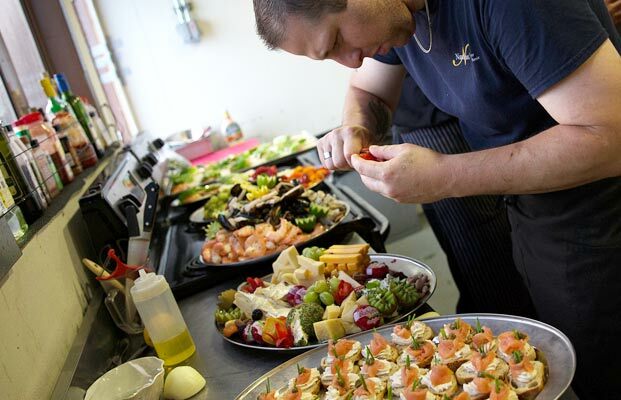 Chef Rory and his delicious platters. Photo by Berkley White. 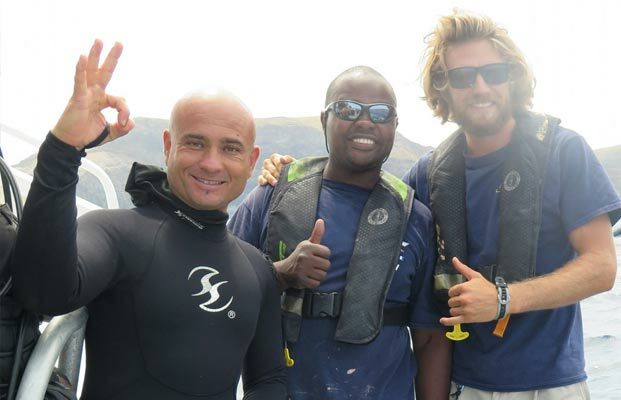 Divemaster Julian, Engineer Charles & Captain Baron. "What a world class ship and crew. From the Captain to the deck hands, every single crew member has gone out of their way to make sure each passenger has a phenominal experience. The cabins are spacious and comfy. The food is all made from scratch and is spectacular! The dive guides know the sites well, and let you venture on your own if you'd like. The dive briefings are very informative." "Having managed a client service team for 15+ years your guys could really teach my team a thing or two! Really impressed with the quality and standard of service across the board. Shaun was a great captain and kept us informed all the time of what was happening and the hostessess and divemasters were great. Both JJ and Nelson made sure that everyone was comfortable with dive plans and adjusted accordingly. Food was fresh and fantastic....although scuppered any plans I had to lose weight doing 4 dives a day! " "All members of the staff did an amazing job and took care of our many individual needs with the utmost concern and professionalism. For instance the chef made an extra effort to accomodate my dietary concerns, and baked a loaf of gluten-free bread specifically for me - and it was delicious!!"